These sites are For sale By Owner and they are located in section 6, The Circle of Honor, in the front cemetery. The cemetery is acting as the owners agent in the resale of these sites. These sites will allow for a flush bronze memorial and the owner is asking $20,000 for these sites. Please contact the cemetery office for more information about this site. Welcome to Ivy Hill Cemetery Co. of Alexandria. The cemetery is a bucolic 22+ acres of rolling hills and urban forest with some ancient trees, a gurgling stream, hosting many species of birds and wildlife in the middle of Alexandria’s residential neighborhoods. Ivy Hill is still an active cemetery for sales and burials as well as an historic destination for visitors from all over the world. The Cemetery is a beautiful place to visit loved ones, or just to experience an oasis of peace and tranquility in a busy and crowded urban area. The lore of Ivy Hill Cemetery has been that the cemetery was farm land donated by Hugh C. Smith at his death. Recent research into the history of Ivy Hill Cemetery discovered that the Cemetery was chartered in 1856, through a sale by the estate of Hugh C. Smith. The executor of his estate sold two parcels of land in September 1854, one for 21 plus acres and the other of 1.7 acres to a group of 30 Alexandrians for the development of a community cemetery that we know as Ivy Hill Cemetery today. The Smith family is also interred in Ivy Hill Cemetery. Ivy Hill Cemetery still has a limited number of ground burial sites available for sale. We also have recently opened 4 new cremation gardens that feature a variety of ways to memorialize loved ones. We have a limited amount of remaining space that can accommodate more families well into the future through traditional burial and cremation inurnment options. Ivy Hill Cemetery could be the ideal spot for anyone’s final resting place. The Ivy Hill Cemetery Historical Preservation Society was formed in 2006 to ensure a future maintenance and care of this historic treasure. 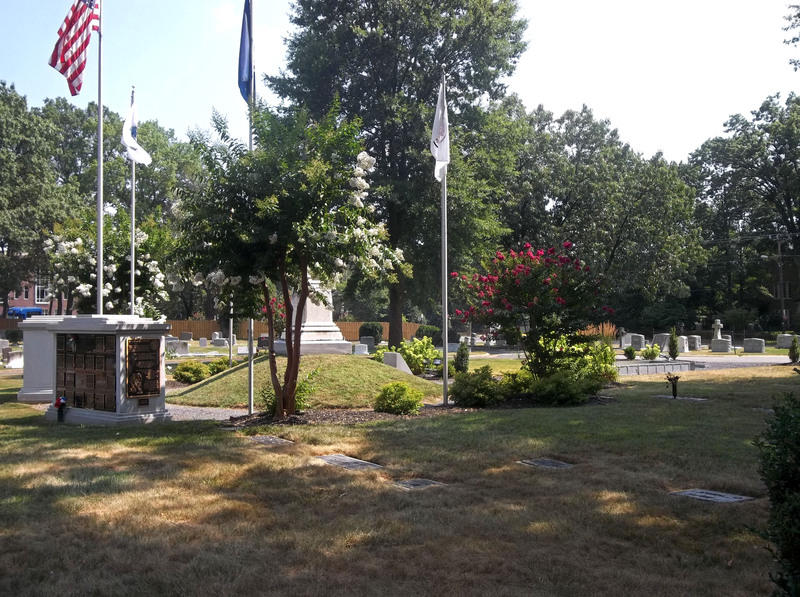 The Preservation Society offers tours, events and volunteer opportunities in order to preserve, protect and promote Ivy Hill Cemetery’s monuments, history and flora/fauna. You can find out more and stay informed through news and events listed on this site; or you can also sign up to receive the Preservation Society’s newsletter. Ivy Hill Cemetery is a private non-denominational cemetery founded in 1856. It is incorporated in the Commonwealth of Virginia and has 501 (c) (13) status, and is able to accept tax deductible donations. The Preservation Society has 501 (c) (3) status under the Internal Revenue Code and is able to accept tax deductible contributions. The Cemetery Grounds are open daily sunrise to sunset. The Cemetery Office is open Monday – Friday from 9 to 4, other times maybe available by appointment.